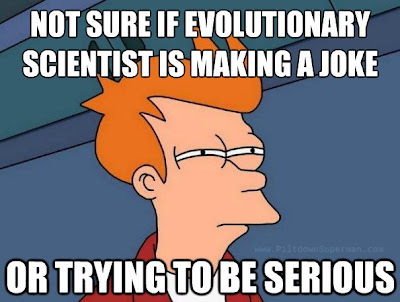 Sometimes, evolutionary "explanations" require the suppression of remarks like, "You gotta be kidding!" in public because they are ridiculous even on the surface. Of course, if a silly explanation of how something evolved is challenged, you may have to endure the standard, "What's your degree in? ", as if only the educated elite are allowed to challenge evolution. But I know stupid stuff when I hear it. Evolutionists attempt to use their worldviews and extrapolate faulty principles with unintentionally humorous results. Sometimes Darwinians are funny. They take themselves so seriously, applying natural selection to everything on earth except their own seriousness. Charlie Green: At New Scientist, Mark van Vugt and Vladas Griskevicius think a little applied Darwinism can turn us a different color. “Let’s use evolution to turn us green,” they said. People want to be green, but they are too stuck in their old ways. Why? It may be time to trawl our deep evolutionary roots for some answers. Natural selection has endowed humans with a psychology best suited to a hunter-gatherer lifestyle, which means that a large portion of human-inflicted ecological damage may well be caused, or seriously exacerbated, by innate tendencies to value self-interest, short-termism, relative status and social imitation, and by our ability to ignore novel threats. What this implies, naturally, is that Vugt & Griskevicius themselves have innate tendencies for self-interest, such as getting paid to write articles claiming natural selection creates their own psychology. On what basis, therefore, could they appeal to reason, logic and morality to get us all to change our behavior, against the pressure of our evolutionary legacy? Should we fight the very forces that so endowed us? Apparently so. They didn’t get the message that other Darwinians now think there’s no way old caveman genes can have any psychological influence on us now (8/20/2012, 2/16/2011). They also apparently haven’t heard that the Easter Island myth of self-destruction is too simplistic (5/19/2010, #4). Maybe all can agree that having some trees downtown is nice. 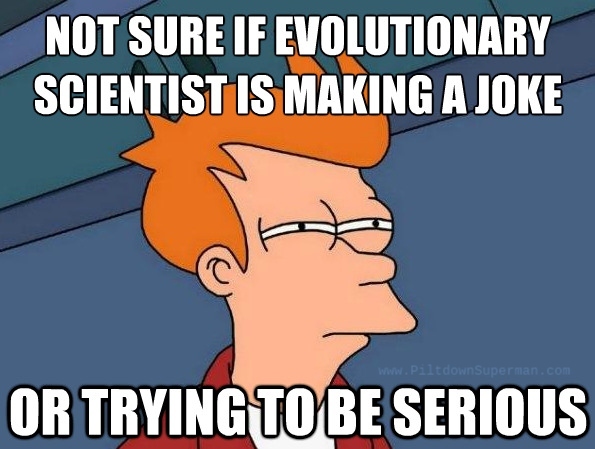 You can giggle your way through the rest of "Evolution Funnies", here.